I’m sure the graphics race isn’t exciting to anybody any more, and while rendering power will obviously continue to grow, it’s nice to see games use other means of attracting attention. 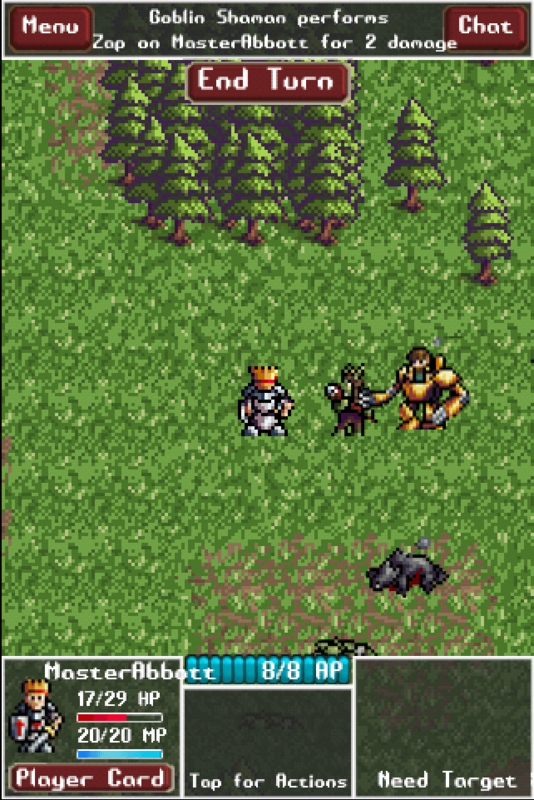 Increasingly popular are casual turn-based games featuring asynchronous gameplay, where players in the same game don’t have to be online at the same time. They can have their turn when it suits them, sync it to their opponents, and check back later to see what the other players have done in response. Far as I can tell, casual game juggernaut Zynga popularized the idea of asynchronous gameplay, applying the structure to virtual versions of classic board games, like Words With Friends (Scrabble) and Draw Something (Pictionary). Soon other classic turn-based games started using it: in a recent update Team 17 applied it to Worms 2: Armageddon. Async is currently doing the rounds of games that can use it, so really, it was only a matter of time before someone applied to the beloved genre of turn-based fantasy RPGs. 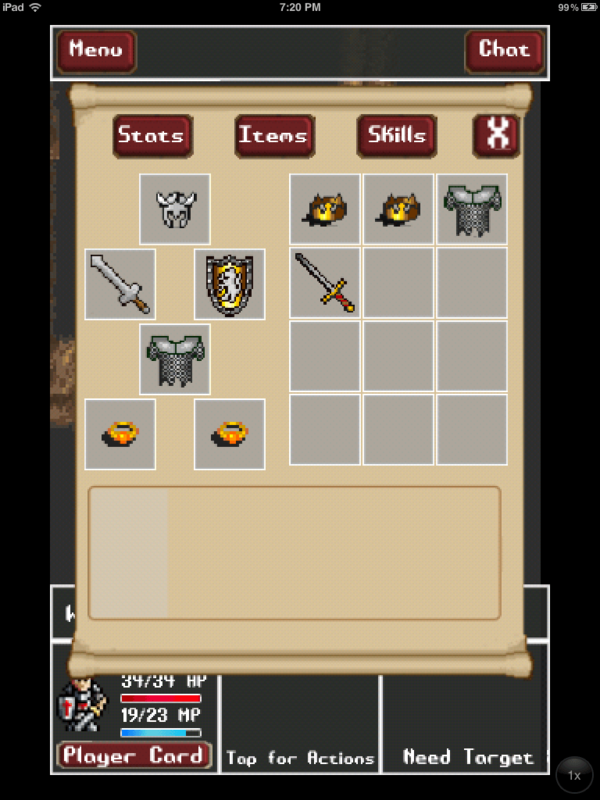 Pocket Heroes uses the async model to differentiate itself from others in its genre, but beyond that structure, it is largely what you’d expect: it’s a turn-based RPG, where up to four players wander round a generic fantasy world from a top-down perspective, slaying goblins and whatnot with swords and bows and magic. 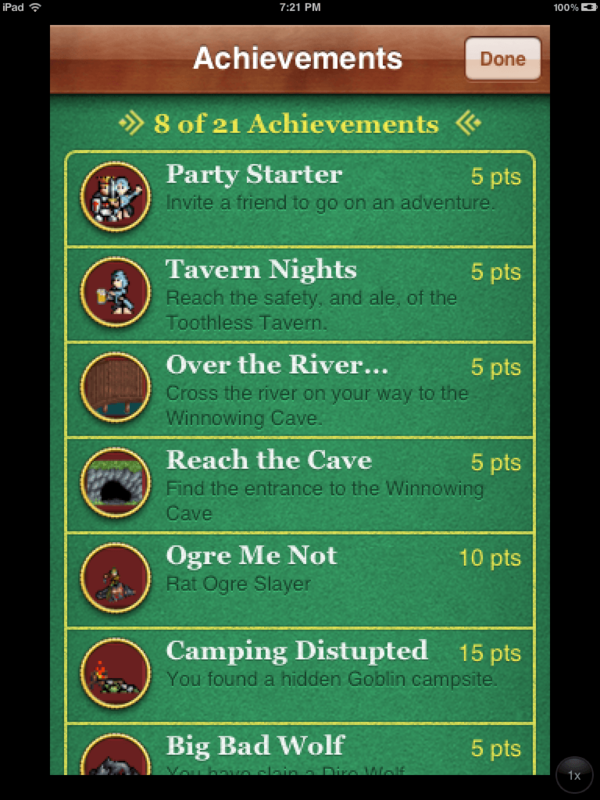 Async play aside, Pocket Heroes is solid and serviceable, but hardly outstanding. Playing with friends, it can be fun to strategise, attack together and defend each other. Your choice of player character includes the usual races and class types: a human Paladin, an elf Rogue, a dwarf Mech, and a High Elf Lunar Sorceress. Each has its own strengths and weaknesses, based on their stats. Defeating enemies rewards you with loot drops, which can be shared among the party members, and include items that boost stats, replenish health, increase weapon damage, etc etc. So far, it’s pretty stock standard, but there’s nothing wrong with that, when it’s done well. If this sounds like your cup of tea, then go for it. The experience may be the best of its kind on the iOS. Unfortunately, there are a few major drawbacks, mostly due to the double-edged sword of asynchronous play. As far as it’s been applied, async works well with the standard RPG mechanics, but it also somewhat messes up the pacing of the game. Ideally, iOS games are designed as time-fillers: the best-selling ones, like Bejewelled or Angry Birds, are so popular because the play sessions are quick to start and scalable. You can have a satisfying session for two minutes in the waiting room at the dentist, or two hours on a train. The problem is that, by design, Pocket Heroes (like many asynchronous games) simply won’t let you get into a comfortable flow of play. You can’t sit down for an hour-long session: you play for a few seconds at most, then end your turn and wait for other players to make a move. The game breaks your engagement with it by forcing you to put it away every thirty seconds. Most asynchronous games overcome this fatal flaw by allowing you to partake in multiple matches simultaneously. Whip out your iPhone for a two-minute session and chances are, one of the matches you’re currently playing is waiting for your input. For longer sessions, by the time you’ve made your move in several matches, it’s probably your turn again in one of them. 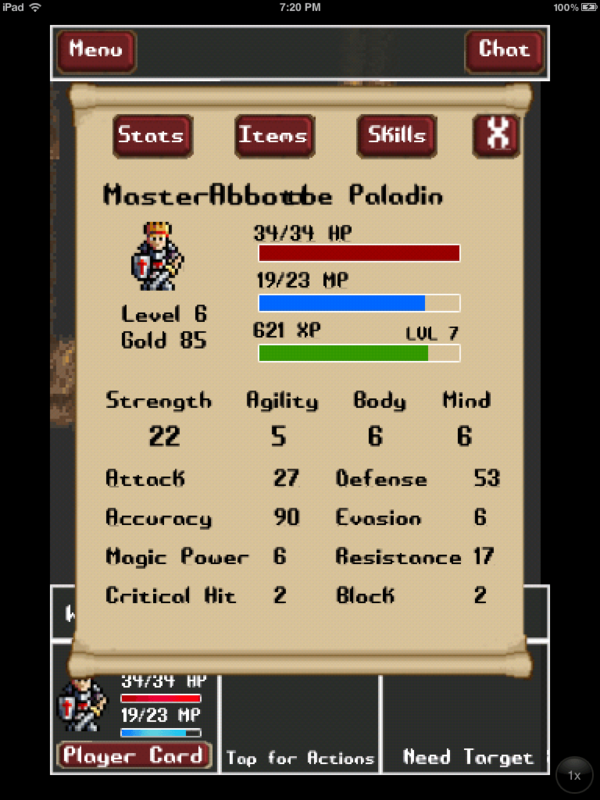 Indeed, Pocket Heroes utilizes this feature, but its usefulness is crippled by two fundamental factors. First, players can only start games with friends, either through email or Game Center. That’s fine in theory: it’s always more fun to play against people you know than randoms, anyway. 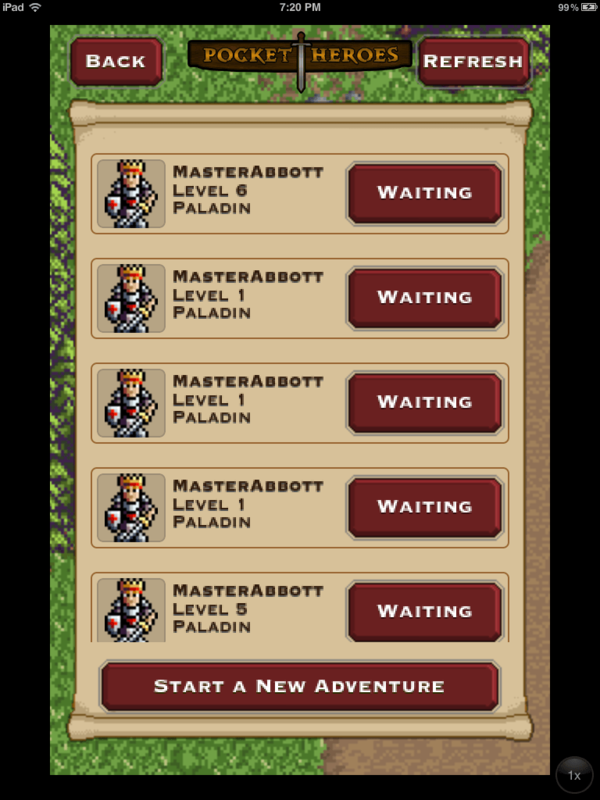 But it assumes that enough of your friends are into Pocket Heroes that you’ll always have someone to play with. That may be true for some, but many will not be able to nag their friends into playing. Random match-making is fundamental for async games, and while it has been promised in an unspecified future update, that essential feature should have been present from launch. Failing that, a single player mode might have been an adequate substitute, to let the Forever Alones stay engaged with the game. The second problem is one that even random matchmaking wouldn’t solve. The asynchronous system clashes heavily with another element that Pocket Heroes proudly uses to promote itself: a focus on level design. 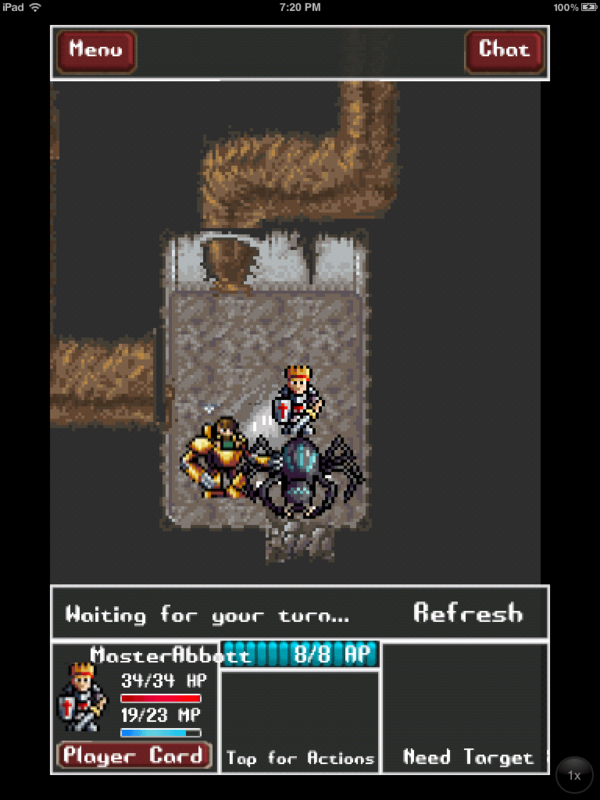 The App Store description demands that players “don’t settle for random dungeon crawls”: the game’s environments are carefully designed to create a satisfying experience. Valuing engaging level design is usually a strong point, but even the best levels become somewhat dull after you go through the same motions four or five times. With every new game comes all the familiar environments, enemy placements, etc, and it soon discourages you from bothering to start over with new teammates. Randomly-generated environments work in this play style because they offer variety: Words With Friends would be exceedingly dull if you started with the exact same letters every time. Pocket Heroes assumes that randomly-generated levels won’t offer the same satisfaction as developer-designed ones, but the elegance of level design isn’t absent in randomized environment generation, it’s simply transferred: there’s an equally-enjoyable elegance in a system designed to allow randomization to create engaging levels. Visually, Pocket Heroes is a treat. It captures the spirit of retro 8-bit RPGs perfectly, with detailed pixel representations of characters and environments. Nostalgia is the winning factor here, and there’s really no other visual style that would suit the game quite as well. This, along with a catchy (albeit repetitive) chiptune-ish soundtrack, gives Pocket Heroes a distinctly classic personality. Asynchronous gameplay is still a novelty, but it holds promise. 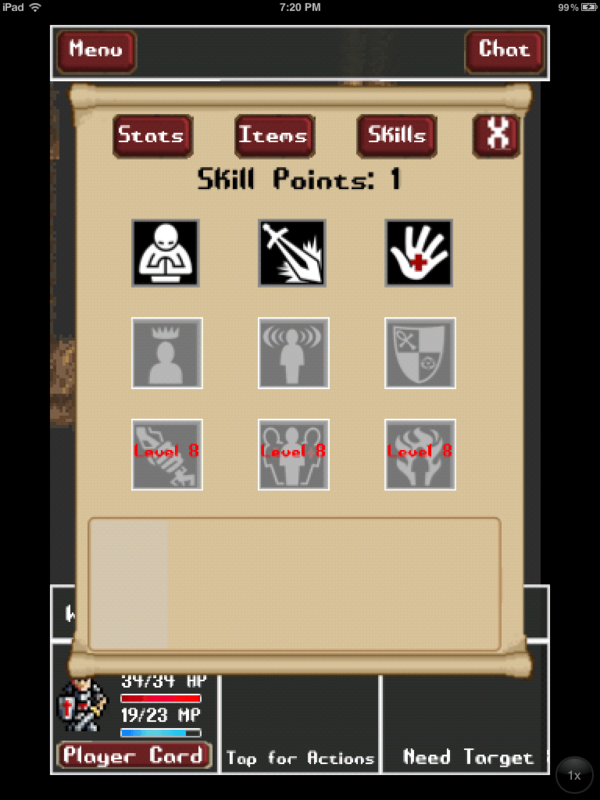 The implementation in Pocket Heroes is decent, but plagued with some fundamental issues. But when you can get into a nice back-and-forth flow with friends, the game works really well. 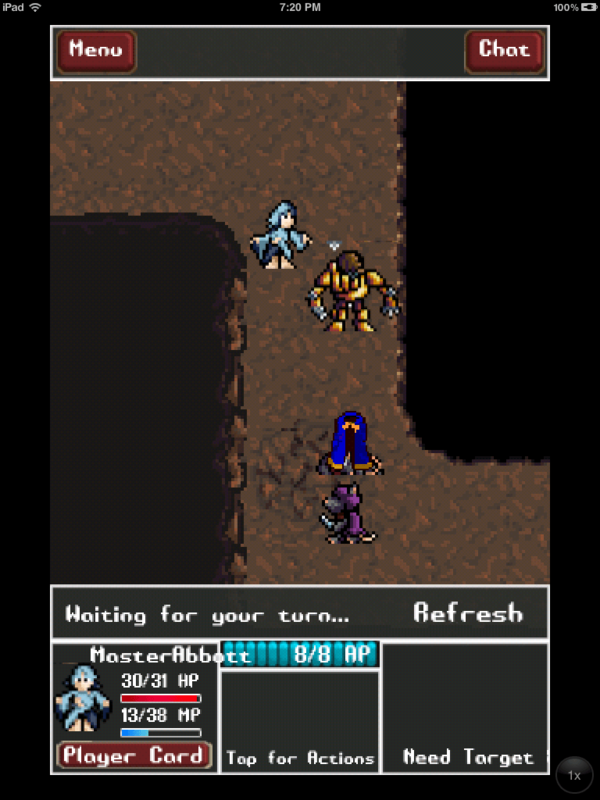 Despite its flaws, Pocket Heroes may capture the hearts of those yearning for an old-school-styled RPG on their iDevice.